Three common failures seen with industrial buildings’ traditional, awning windows are explored in the following paragraphs. 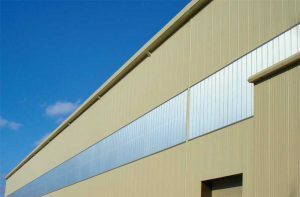 Failing industrial windows show signs of discolored glazing and rusted frames that significantly compromise performance, light transmission, and appearance. For more than a century, steel framing and glazing putty were used to secure the glass in many industrial windows. If the windows were not re-glazed, the putty would shrink and crack, leaving little to hold the glass in place. When a window has reached such a deteriorated state, both safety and thermal performance are compromised. When broken or missing glass is noticed, the openings may be simply boarded up. This solution is also considered when rust on steel sash windows or broken operating hardware limits functionality. While it does cover up unsightly and inoperable units, this creates new problems by reducing ventilation and daylight. Decreased light transmission also occurs when aging fiber-reinforced plastic’s (FRP’s) exposed glass fibers trap dirt and dust and become yellowed and discolored. Along with these unpleasant visual cues, the FRP may even emit a distinct odor due to the infiltrated water causing bacterial growth. Viewed from the exterior, cellular polycarbonate glazing (CPG) systems present a clean, modern aesthetic requiring minimal maintenance. All these types of industrial window failures can be attributed to lack of maintenance. When specifying a replacement window system, cellular polycarbonate glazing (CPG) panels offer several advantages for low maintenance and high performance, including the following facts. With safety in mind, CPG panels are up to 250 times more impact resistant than glass and will not shatter or fracture. Across the United States, industrial building applications frequently are not conditioned. For colder climates, a 40-mm (1 ½-in.) CPG panel provides an R-value range of 3 to 5 for thermal insulation, and in warmer climates, the same panel’s solar heat gain coefficient (SHGC) can range from 0.45 to 0.68. Supporting natural ventilation and repetitive use, awning window systems with CPG panels can be specified with extruded aluminum, top-hinge mechanisms that will not rust, bind, or seize. Taking advantage of daylight, CPG panels offer up to 70 percent light transmission. To help eliminate hots spots and glare, diffused light may be equally important to safety and productivity in an industrial setting. Specifiers experienced with industrial buildings also understand these tend to be large facilities requiring many hours of project management and coordination. To avoid future failures, it is advisable to select a window system manufacturer experienced in retrofitting industrial buildings. Jim Leslie manages all operational and strategic endeavors for Exterior Technologies (EXTECH). 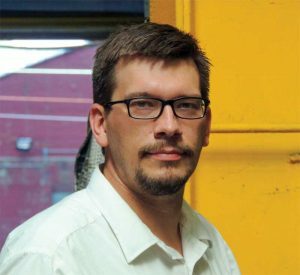 Supporting architectural designers and specifiers, he also oversees the company’s continuing education program and communications. A graduate of Penn State University,he has more than 15 years of work experience in the architectural, engineering, and construction (AEC) industry. He can be contacted at jleslie@extechinc.com. Mr. Leslie – Thank you for the informative article and I can see some advantages of using CPG as to traditional glazing. One think I did not read is the age old opinion of Polycarbonate, that as it begins to age, it scratches more easily than glass, so cleaning of the surface traditionally would need to be done with “kid gloves”. It would be interesting to do a follow-up to touch on durability and maintenance of CPG. Thank you.